Northen Lights home Gyms in Kingston. Proudly Canadian. The Colorado is a great example of the product enhancements that are occurring at Northernern Lights. Northern Lights has taken the Colorado, one our best performing home gyms, and have re-designed, reshaped, and refined it to elevate it to one of the best values in the industry. The new Colorado has the best of both worlds, providing the user with the traditional fixed path exercise, and it also offers the muscle stimulating freedom of movement like many more expensive cable gyms and commercial strength products offer. Incorporating our new Freedom Arm technology, the user can perform many chest exercises without any adjustments to the machine. 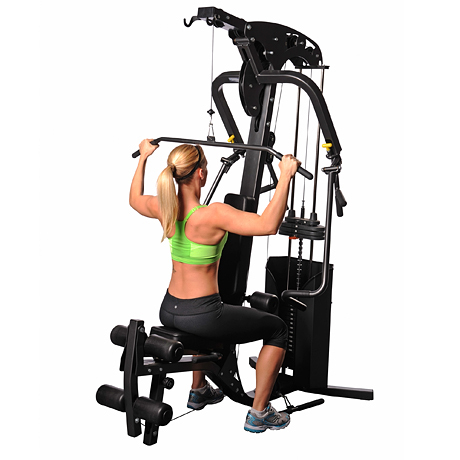 The user can perform a converging chest press and a chest fly movement, as well as an incline converging press and incline fly movement without stopping to make any adjustments to the seat position, the grip, or the movement arm. The Freedom Arm technology gives the user the ability to define their own path of movement, on each repetition. This freedom of movement also increases the development of secondary movers or support muscles, which improves overall functional strength. The Multi-Grip handles on the Freedom Arms provide the user with a more comfortable workout. The Multi-grips also add the ability to be flexible with the muscle group concentration for the exercise as well. The vertical and horizontal grips on the rowing bar allow for proper bio-mechanical positioning to differentiate upper back from lower/mid back exercises. Combined with the high pulley or lat pull down station, and low pulley, you can get a complete back workout on the Colorado. The adjustable leg extension/leg curl station provides a comfortable platform for leg exercises. The low pulley station rotates on a swivel for extra comfort and flexibility for a variety of exercises. The Colorado has a compact design and small footprint that is essential to many people. The exclusive Ergo-Tech pads enhance the exercise experience with comfort, safety, and durability. Built with the Northern Lights exceptional quality and durability, the Colorado will be your workout partner for many years to come.